JNN 23 Mar 2015 Delhi : Images of Indian students blatantly cheating on school-leaving examinations under the noses of supervisors have gone viral, inviting ridicule on Twitter and exposing flaws in the much-maligned education system of an impoverished eastern state. 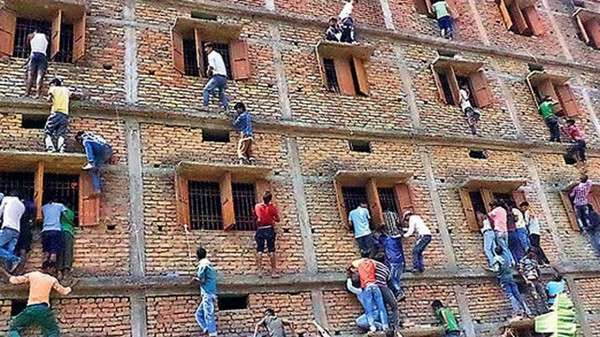 On Thursday, the Hindustan Times published a photo of dozens of men clambering up the wall of a four-floor test center in Bihar state, perched on window ledges as they folded answer sheets into paper planes flown into classrooms. Attempts to chase away family members lurking outside test centers on Thursday backfired, with stone-pelting mobs forcing police to beat a retreat. This entry was posted in Asia Pacific and tagged Bihar, Bihar School Examination Board, Bihar state, Exams cheating, india, Prashant Kumar Shahi, test centers. Bookmark the permalink.